There will be spoilers contained in this piece if you have not yet watched the Free4All, be aware. The Movie Trivia Schmoedown’s latest “big event” dropped on YouTube yesterday, April 13th as the second annual Free4All was revealed in two parts. I am not sure that there was as much promotion for the Free4All this year as it did sneak up on me and made for an exciting surprise. 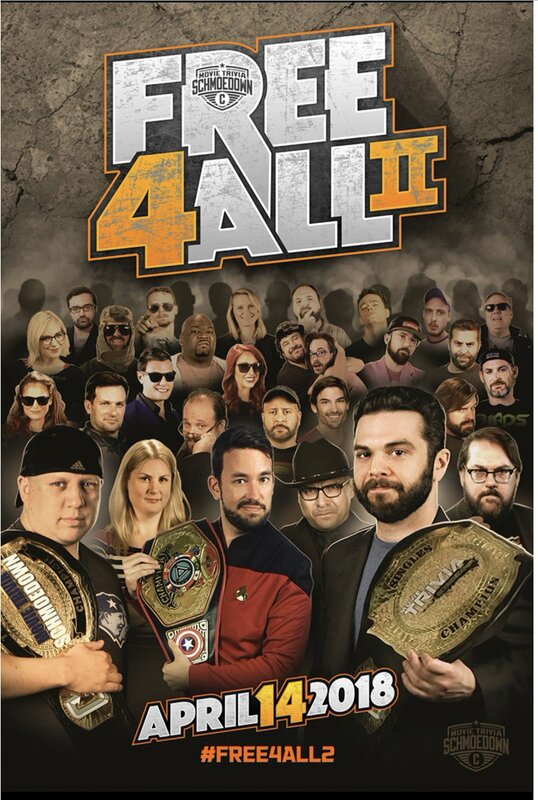 As the Movie Trivia Schmoedown has some of its roots in the world of the WWE, the Free4All would be like the Royal Rumble, which is always one of my favorite events of the year. The unpredictability of whom is coming next always makes for exciting television. While this year’s competition may not have had an amazing moment as the XX5XX moment from last year, there was some great displays of movie trivia knowledge and a ton of fun entrances and surprises. I’m going to jump around the two videos and give my thoughts on them, in no particular order. If you have not yet seen these, they are absolutely worth your time. Here is a link to PART ONE and PART TWO. I found myself cheering for William “The Beast” Bibbiani for most of the time. Bibbiani, an online critic, is one of the most engaging and colorful characters in the Schmoedown and his Baby Driver entrance was a lot of fun. Bibbiani lasted an astonishing 21 rounds. After entering at number 20, Bibbiani was in the final five. He was remarkable in his trivia knowledge and was very funny with his quips and jokes. John Rocha seemed annoyed by The Beast, but I found him completely enthralling. Bibbiani was named the Free4All MVP. There were 48 competitors this year, up 13 from last year, but there were still some famous names missing from the event. JTE’s partner Jeff Sneider, the Innergeekdom champion Jason Inman and former champion Dan Murrell were missing. Yes, Dan Murrell was retired, but I know there were people online that were hoping to see Dan make a special return for the Fee4All. This gave the Schmoedown a license to swerve us all. In Shawn Michaels-in-Montreal-playing-Bret-Hart’s-music stature, they played Dan’s music and even announced him as #47, but in truth, it was a returning Team Action member Andrew Ghai. You could almost hear the sigh of relief from the rest of the group when it was revealed that it was NOT Murrell coming through the curtain. There was no controversy in the Free4All, but there was a moment where I thought there should have been. There were tons of “Jane Fonda” jokes at the expense of John Rocha. If you do not know about this, in a team match vs. the Patriots, Rocha changed an answer at the last minute, scribbling Jane Fonda illegibly on the white board. This led to a huge controversy. Well, here, RB3 wrote down the answer Tippi Hedren and you clearly cannot read the last name. He was given this point, and I think he should not have been. They took away points from others who only wrote the first name and, to be fair, you cannot make out Hedren here. And the t-shirt hocking “The Wildman” Josh Macuga of the Wildberries, whose gimmick is that they are hard drinkers. The Wildberries have become one of the more popular teams int he Schmoedown and this kind of antics are why. A little help in this pose from Mark Ellis and Roxie Striar, as well as Macuga’s Wildberries teammate Eliot Newberry. Macuga had made his presence felt throughout the Free4All as you could hear him shouting from the crowd many times prior to his entrance. His loud brashness fits with the character, but did, at times, appear to irritate some of the competitors. His ultimate interruption was when his teammate was announced, Josh pulled a little drunken race across stage, yelling Wildberries. In the end, Miss Movies won the competition, outlasting Bibbiani and rookie Ethan Erwin (who was very impressive as well, lasting 15 rounds). The Free4All chose that once all competitors had been introduced, the high score at that table would be the winner, which was kind of odd. I don’t know if they chose to do that because of how long the day would have already been, but it took away some of the drama. If the winner would have had to eliminate each opponent until there was only one left, that would have really cemented the suspense. Not taking anything away from Brianne’s win because she certainly earned it. Last season, Brianne stepped aside from the Schmoedown citing personal issues. Although I never officially heard her state for certain why she did that, there were some rumors of depression being the cause. If that is the case, she should be commended all the more for returning and winning the whole thing. With her win, Miss Movies has earned an automatic title shot at whatever title she chooses. There were some fun returns to the Schmoedown as well. Besides Andrew Ghai, Mark Reilly came out of retirement for one night only and joined the game. Tom Dagino’s alter ego Finstock, pulling a page out of Mick Foley, also made a return to the Schmoedown after being suspended for over a year. The Movie Trivia Schmoedown does these large “PPV-style” events extremely well and the Free4All is just the most recent. I watched late into the night Friday, enjoying the pageantry and being awed by the impressive knowledge of a lot of my favorite YouTube personalities. Kristian Harloff should be commended for his dedication and efforts to provide the best entertainment to the audience. He is one of the major driving forces behind the Schmoedown, along with Mark Ellis and several others, and you can see the passion for this project every time Harloff takes the stage.